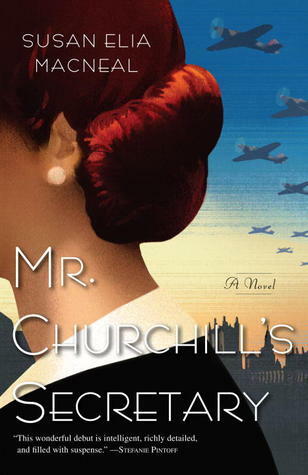 Mr. Churchill's Secretary (2012) by Susan Elia MacNeal follows the war-time adventures of Maggie Hope who has just landed a job as a typist at 10 Downing Street under the brand-new Prime Minister Winston Churchill. Maggie is a British girl--but spent most of her life in the United States with her aunt after her parents were killed in an automobile accident. Her aunt, also British, had accepted an academic position in the States and taken the young Margaret with her. Maggie, all grown up with a mathematics degree under her belt, returned to England to sell the aunt's house and when she found it impossible to sell in the current market she decided to stay in England. She had hopes of doing more important war work than just typing--after all, with her degree she felt she could manage a high-level private secretarial position just as well as her good friend David who works at Downing Street. But she found that door closed--tightly shut as an all-boys club. David convinces her to take the typist's position when her predecessor is murdered--stabbed in what is officially being called a mugging, but there are rumors that it may have been more serious. It isn't long before Maggie's flair for intricate problems and remarkable code-breaking ability plunges her into more difficult situations than typing fast enough to keep up with Churchill. She finds herself in the middle of a plot that involves her very much alive father, a threat to the Prime Minister, and bomb hidden somewhere in St. Paul's Cathedral. She has some very important war work to do after all. This is a nice introduction to a new series. MacNeal has invested a lot in historical research and it definitely shows--although there are moments when Maggie uses certain phrases that sound very 2012-ish rather than 1940-ish. Not often enough to really jar, but momentarily distracting. I enjoyed getting to know Maggie and her friends very much and felt that this book was really a "getting-to-know-you" effort rather than a total immersion in Maggie's world. I look forward to Maggie finding her feet and settling down to her work in future installments. And perhaps when she is more settled, the reader will be as well.